Please contact boat owner Joseph at 239-410-2814. Second owner 1900 original hours. 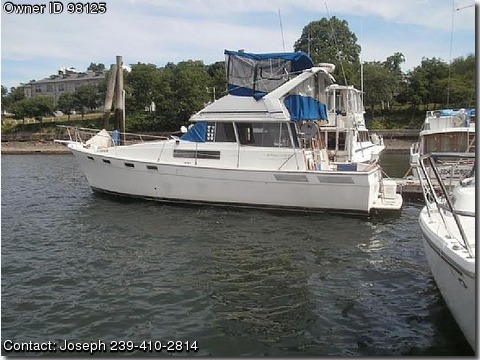 Has windlass anchor, Bimini top, full canvas, 4 bilge pumps, carpet, Coast Guard pack, compass, depthfinder, fishfinder, GPS, dual controls, enclosed flybridge, full gauges, 2 heads, shower, H&amp;C water, tub, Raymarine C120 radar, VHF, 3 batteries, Galley, refrigerator, Princess stove, storage, sleeps 6, TV/VCR, prof. maintained. Has been our summer home, and is in good condition.